0	0	Renée of France	In Stock - Order before 2pm for same day dispatchWant it on Wednesday 24 April? An unknown Italian women, Renée of France was a princess royal, wife to a feudal prince of the Pope and a firm supporter of the rising movement, known today as the Reformation. 16th Century Italy was in a transitional stage, and Renée was placed in between the two opposing sides – her husband the Duke of Ferrara (a devoted follower and employee of the Pope), and John Calvin (a key player in the Reformation movement). Thanks to excellent sources, and a skillful writer, this biography transports the reader to this volatile stage in Christianity to experience how this faithful women influenced the changing world. Renée of France by Simonetta Carr was published by Evangelical Press in January 2013 and is our 45348th best seller. The ISBN for Renée of France is 9780852349090. Renée of France lived in the 16th century and was a friend and correspondent of John Calvin. This book recounts the main events of her life which, due to the brevity of the book make for fairly dry reading. However, because she was a Protestant noblewomen married to a Catholic nobleman she lived at a time of religious and political turmoil, which is what makes her story worth telling. The impression given by her remaining letters is of a strong-minded woman who struggled to reconcile her faith with the predominant Catholicism of those who surrounded her, which is what makes her correspondence with Calvin interesting. The last chapter of the book reproduces some of Calvin's thoughts on issues such as the Mass and the unity of the Old and New Testaments, which have more resonance when we consider the times in which they were written. The book is part of a series called Bitesize Biographies, and would make a useful reference tool. The author has obviously done a huge amount of research and had concentrated on presenting the facts rather than painting a portrait of the person. Got a question? No problem! Just click here to ask us about Renée of France. Renée of France is little known today, but this fascinating and often controversial woman was a correspondent of Calvin. She loved the Reformation, but in 16th century Italy such a position could not be lightly held. Add in a husband (the Duke of Ferrara) who served the Pope and was determined to oppose Renée, plus the complexity and intrigues of Italian society of the time and you have all the ingredients for a gripping biography. 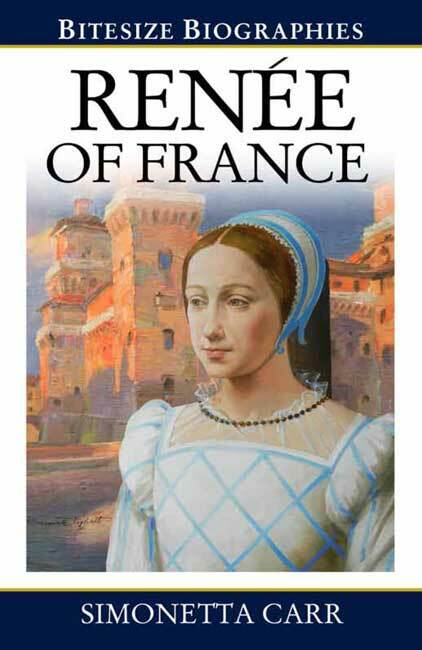 The author is clear that this book does not give a definitive answer to who Renee of France was; but, rather, a brief look at the life of a woman who made difficult choices, and asked stimulating questions, is offered. There may be those who recognize themselves in her struggles as a wife, mother or a ruler. She received constant and encouraging counsel from John Calvin. This counsel was vital for that time, but is also relevant for today. Prof.Dr.Herman J.Selderhuis, professor of church history in the Netherlands, observes: "Simonetta Carr has succeeded in making the reader of her fine book a contemporary, yes, even a close friend of Renée of France. Based on the sources, written with great quality and a pleasure to read, is the fascinating story of this royal woman." “Simonetta Carr has succeeded in making the reader of her fine book a contemporary, yes, even a close friend of Renée of France.” - Prof. Dr. Herman J. Selderhuis, Professor at Theological University Apeldoorn (Netherlands). “This book provides a sketch on the complex movement of Reformation in Italy as seen and lived by a French royal princess, wife of a feudal prince of the pope.” - Rev. Dr Emanuele Fiume, Pastor of the Waldensian Church in Rome.